Provide long-lasting power for your camera with this Digital 90 2-Battery Kit with TWIN Charger & QR-SDH Plate kit from B&H Photo. 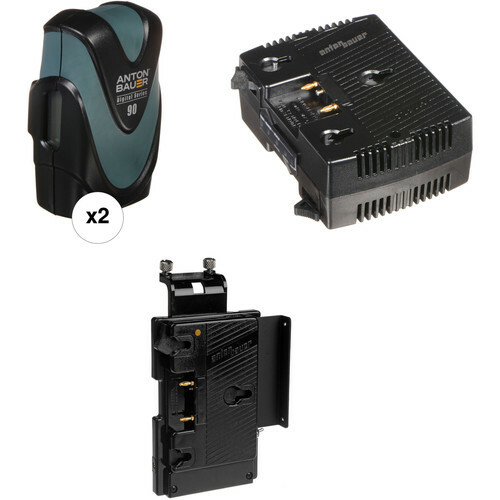 This kit includes two Gold mount Digital 90 batteries and one TWIN simultaneous charger. The included QR-SDH V-mount to Gold mount adapter is compatible with Sony XDCAM HD, XDCAM EX, SX, select Sony HD, legacy Digital Betacam, and Betacam SX camcorders. The Anton Bauer Digital 90 Gold Mount Battery (14.4V, 93 Wh), along with the rest of the Digital Battery Series, represents a major makeover for Anton Bauer, featuring a redesign in several aspects over previous series. The result is a long-lasting, sleek and ergonomic, smart, and safe series of batteries, projected for 1000 charge/discharge cycles. The Digital 90 runs on lithium-ion Sanyo cells which Anton Bauer has found to be highly reliable for them in the past. One of the major changes is a reconstruction of the honeycomb interior, built very spacious and housing the cells physically separated from one another, each individually wrapped in its own plastic case and isolated from the others. This ensures that any potential damage to one cell will have no effect on the others, huge for safety. The additional space in the honeycomb also serves to allow more airflow between the cells, effecting more heat dissipation, which will keep the cells cooler and protect them from aging faster. As another safety precaution, for instances of above average weather conditions, multiple sensors are built in that detect when the battery is too hot or too cold and trigger a shut down until the temperature is back to normal, at which point the battery automatically turns back on. Designed to the demands of broadcast and cinema digital cameras, the Digital Battery Series employs an algorithm that addresses the issue of "ringing" common to digital cameras. Where batteries are commonly susceptible to sporadic bursts of excess power draw, similar to how a car eats up more gas when the gas pedal is hit too hard, this algorithm smoothes out the power draw, in turn affording longer lasting, more predictable runs with a particular camera and overall longer life. The Digital Battery Series is compatible with the concurrently released Performance Series of chargers and with all previous Anton Bauer chargers. Used with any of these chargers, via a feature that has become common to the Anton Bauer name, the Digital 90 exchanges certain digital data with the charger that allows the selection of the best charge routine possible for the battery's cell chemistry, maximizing overall life. Via another familiar Anton Bauer feature, the Digital 90 applies a continuous and constant calibration that enables it to provide more and more accurate capacity and run-time calculations over the life of the battery. Run-time is usefully reported in hours and minutes on an easy-to-read LCD when power is being drawn, and as a percentage value when no load is attached. The reporting in hours and minutes will only get more and more precise with each use as a result of the constant calibration feature. The aesthetics have also taken a redesign, with the body shaped ergonomically for a comfortable hold and modern look, and the outer jacket made of rubber that provides a good grip as well as a cushion against accidental drops. The case is made of high-impact polymer, which is the same material used in motorcycle helmets. A P-Tap output is available for powering accessories. The Anton Bauer TWIN Simultaneous Charger provides charging for two Gold mount batteries. Features include full InterActive charging technology, a slim and ultra-lightweight design, and a three-LED status display. The TWIN Charger is compatible with any Logic Series Gold mount battery and accepts 100-240 V, 50-60 Hz AC input power. Anton Bauer's InterActive communication enables the TWIN charger to determine the precise charge routine for any compatible Anton Bauer battery under its present condition. Three-stage charging includes a high-rate first stage, second-stage equalizing of any cell imbalance, and third-stage LifeSaver maintenance mode. Anton Bauer's QR-SDH Wedge Mount Battery Adapter mounts quickly on select video cameras with a V-mount wedge, enabling them to accept a Gold mount battery. Compatible cameras include Sony XDCAM HD, XDCAM EX, SX, and select Sony HD cameras. This adapter can also be used with legacy Digital Betacam and Betacam SX camcorders. Box Dimensions (LxWxH) 9.45 x 7.6 x 7.5"
Box Dimensions (LxWxH) 10.5 x 9.6 x 2.5"
Box Dimensions (LxWxH) 9.55 x 5.0 x 2.3"